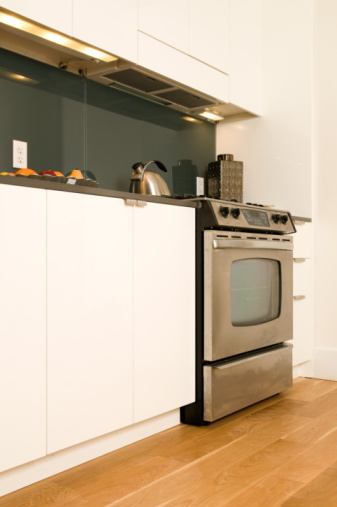 A KitchenAid convection oven provides even heat to all cooking racks. The even temperature inside the convection oven cooks food without burning the edges or bottoms in order to thoroughly cook the entire dish. If the convection oven is not operating as it should or does not maintain the desired temperature, inspect it and determine whether the problem can be resolved without professional assistance. This could save the cost of an unnecessary service call. Ensure the electronic oven control is on the correct setting. The oven display shows the selected temperature, heat source and start time. If the display does not show the selected settings or shows "Err," press the "Off" key on the control pad and re-enter the desired settings. Turn off the delay start feature. If the oven has been programmed to start at a certain time, the oven will not turn on until the selected time. Press the "Off" button to turn off timed cooking. Ensure the control lock feature is not enabled. If the display shows "Control Lock," press and hold the "Start" button for five seconds. "Control Lock" will disappear from the display. Deactivate the Sabbath mode. Open the oven door, press the "Off" button and enter "7896" on the keypad. Press the "Start" button. The Sabbath mode is now disabled. Press "Off" to clear the display. Calibrate the oven temperature. Press the "Options" button and press "6" on the keypad. Increase the temperature by pressing the "3" key. Decrease the temperature by pressing the "6" key. Press the "Start" button. The oven temperature calibration is complete. Check the display. If "Set clock" is shown, proceed to set the clock. If a letter and number are displayed, proceed to clear the message. Press the "Clock Set/Start" button to set the clock. Use the number keys to enter the correct time. Press the "Clock Set/Start" button again. Press the "Off" button to clear the letter and number from the display. If it reappears after it is cleared, call a qualified service technician. Ensure the oven door is completely closed. Press the "Self Clean" button, then press the "Start" key. The display will show "Locking Door," then "Oven is Cleaning" will be displayed briefly. "Door Locked" will show on the display until the self-clean cycle has completed. "Self Clean Complete" will display once the entire cycle is complete. Press any key or open the oven door to clear the display. Check the oven display. If "Delay" appears on the display, a delayed start has been selected for the self-cleaning cycle. Self-cleaning will start at the selected time.